A good view of the railway station. Also interesting in that the Church of Scotland is standing alone. 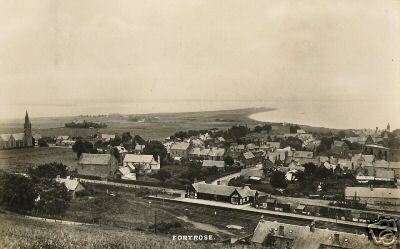 The family used to stay at the Camping Coach at Fortrose in the late 1950's. Great fun apart from the fact that we had to use the station toilet - OK during the day but not so great at night. One engine a day used to come in at about midday and used the turntable to turn round. As children we used to have great fun with the turntable until one day it got stuck just as the train was due. Needless to say, we used the old Scottish excuse that "It wis'nae me, it was a big boy and he ran away". Good times. During our stay at the Camping Coach in the late 1950's, I remember as a 7 year old being sent by Mother to the Grocers and/or General store in the High Street for potatoes. In Edinburgh, we always used the expression of a "forpit" or potatoes which, I think, is about 3/4 pounds of potatoes. This expression was foreign to the shop assistant who suggested perhaps I meant 4 stone to which I happily agreed. Repeated trips to the storehouse by the shop assisant and the increasing pile of potatoes at my feet made us both suspicious that perhaps it was not four stone but four pounds. It took some time before a halt was called and I was sent on my way with 4 pounds of potatoes. The innocence of youth! As a family we are not sure where the expression "Forpit" meaning three or four pounds came from or even what the correct spellings is. While the family was, and still is, based mostly in Edinburgh my Mother came from Dingwall (although born and raised until the age of about 4 at the, still standing, Fodderty Junction railway cottage.) so whether it is a Highland or Edinburgh expression I do not know. It is fantastic to think that the contributor may be one of the family i played with those sumers so long ago. I remeber the grocers but not forpits. I also remember being invited to eat with the family (perhaps those tatties) but my mum was not keen i think she thought i had asked if i could! i remembver two fishing boats beached at the time and one of the brothers spending days on end helping an old fisherman potter about on the boats trying to mend things. We used to get sent to find him to come home for his meal- tatties again? Is there any chance of the other correspondent perhaps putting the christian names of the brothers and sisters on the site to see if any spark a memory? I hope they remeber me, Tom Macdonald, noe in my 50's with a family and farm of my own. I continue to be amazed at the prospect of the family being the same as I played with all those years ago. I hope you contributor does not object to my attempts to remember some of the names, not from memory but from my "Letts" diary of the time, found after a great deal of attic searching! Was there a Sinclair?, a Philip or Phil? I remember he was very tanned compared to his immediate brother and sister- I did a drawing of him - my diary says there was (what looks like) a Margrait? but that must be my bad spelling. there is also a word that looks like Stooey? I have named one of my new calves after that one! No other details other than another game with the visitors (spelled wrongly of course) and one entry saying they had all gone to church. Do the family wish to get in touch? The church was at one time the United Free Church of Scotland which it could be in this photo as UF church came into being in 1900 with the union of the Free Church of Scotland and the United Presbyterian Church.